During CES Sony unveiled some new LED-backlit LCD TVs under the Triluminos brand, which use QDvision's quantum dot films to enhance the color gamut. Apparently the new TV's color gamut is quite close to OLED TVs, although the contrast is not as good. 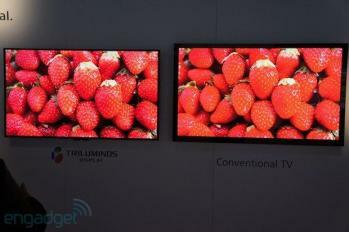 As far as we know these are the first TVs to use Quantum Dots enhancement films. According to reports, the company no longer develops Q-LED (or QDLED) displays as these panels have been too difficult to produce reliably, and they now focus on the QD films. I interviewed QDVision's CTO and co-founder back in 2009 - and this still gives a good introduction to QDots. Another company that develops QD Films for LCD panels is Nanosys - which recently raised $15 million to increase production capacity for thier QDEF film. Nanosys' technology is a stand-alone film that can be inserted into LCDs, while QD Vision's technology is more integrated into the LCD production process. I visited both companies' booths at SID 2012.